Daily Mirror UK, 8 APR 2019. These shocking photos capture how brutal bare-knuckle boxing can be - causing gruesome gashes, ripped eye-sockets, broken limbs and other ghastly wounds . 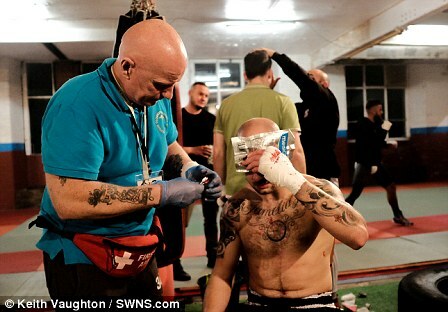 Ultimate Bare Knuckle Boxing (UBKB) is the only bare-knuckle academy in the UK and is inundated with phone calls from eager men all over the world desperate to train and get in the ring, Manchester Evening News reports. It is run by married couple Shaun and Amanda Smith in Warrington, Cheshire. In the sport, fighters don't wear gloves - protecting their hands with bandages before stepping in the ring - but the rules are much the same as boxing. Referees and paramedics are on hand to deal with injuries, some of which can be extremely serious. The husband and wife say athletes have twisted ankles, fractured collarbones ripped skin apart in massive gashes and even tore out eye sockets. The tough sport is not illegal - but it is unregulated, with no official watchdog. Where police disperse fights, they tend to be ones held outside, broken up on public order grounds. Meanwhile councils and venues are allowing indoor events to go ahead, including the O2 Arena in Greenwich, London. But the tough sport has now made Manchester its permanent home, with crowds of up to 1600 turning up to the Bowlers Exhibition Centre at Trafford Park to see the fights, which take place around four times a year. Shaun said: "We've just had a fight where someone broke his wrist, if you hit someone on the head you can break your wrist. "We had a broken jaw, broken eye-socket, a lad from Norway broke his ankle, someone's eye ripped to bits. They still all can't wait to fight again. "We want to get our fighters right mentally because it's a big shock when you go into the ring and get hit with a bare knuckle. "When you take that first punch and it's bone on bone, it's like getting stabbed with a thousand knives." But the club isn't filled with gangsters, underground fighters and criminals, organisers say - it's strictly disciplined and competitors are forced to undergo a strict training regimen before Shaun will even consider allowing them to fight. Shaun added: "The demand now is just phenomenal. "Every time we have a show we get more and more interest. On our books we now have 80 fighters who want to fight. "We don't let anyone fight unless they have been here and trained with us, we are really strict. "We don't just put anyone in the ring, you have got to be fit to fight. Not only physically fit but mentally fit too. "We've never had any trouble at the shows, they are fantastic people. A lot of people see it as the underworld, gangsters, villains - it's not like that. If you come to our show, it's like a girls' night out now." Before any fight Shaun runs a six to eight week long training camp. Those competing have to undertake a medical exam and a drugs test before each fight. Shaun is known as 'Britain's Scariest Debt Collector' and travels the country - and Europe - reclaiming money. "We're family oriented. We properly look after them, they get a phone call once a week asking if they're okay," Shaun said. Amanda added: "I had a mum on the last show who managed to grab me and told me we saved her son's life. "Before coming here, they didn't know where he was from one day to the next, and now he is just flying. He is here every day. Shaun added: "There has never been a death in bare knuckle boxing. And boxing only grew out of bare-knuckle. "It's because people say it's traditional - it has never been illegal as boxing gloves were only introduced to protect the boxer's hands." Though it is legal in the UK, bare-knuckle boxing has no official regulator and is not governed by the British Boxing Board of Control (BBBC). Last year London's O2 Arena hosted 14 fights to an audience of more than 2,000 spectators. It was the first time ever the venue had staged the sport. Fans of the sport talked up its popularity, speculating that it will soon be governed by a regulator. But at the time the BBBC stated that it saw no reason to become involved in gloveless fighting. Boxing was originally performed without gloves in the UK, but in 1892 gloves were introduced to create the sport most are familiar with today. Since then, bare-knuckle fights have remained legal, but nobody has founded a regulator to bring groups the groups performing it in line. Consequently, clubs are allowed to operate without licences - because they don't exist - unless the government intervenes.